Sea Club II, featured on HGTV's Beachfront Bargain Hunt! 5 minute walk to the beach across the street. Gated complex. Our condo has just been remodeled with granite counter tops, stainless steel appliances, dishwasher, cabinets, new tile, new bathroom, and new furniture. We have included all the essentials for a family that likes to have the flexibility to make meals at 'home' or somewhere to keep the basics for breakfast and lunch and minimize the vacation expenses. There is a Keurig K55 and a french press for your caffeine needs. At the same time don't miss out on the excellent restaurants that range from fresh-caught seafood to casual beach fare to fine dining, all nearby. The master bedroom has a king size bed, ceiling fan, 55" HDMI flat-screen cable tv with DVD and dresser. The living room includes a queen size sleeper sofa, end-tables and flat screen cable tv. The kitchen has everything you need - all new coffee maker, toaster, fridge with ice-maker, cookware, dishes, glasses, silverware, oven/range and dishwasher. The bathroom has been updated to include beautiful tile work and a large shower/bath. Kitchen towels, bath towels and sheets are all provided. Just bring your beach towels and you are all set for an amazing time on Siesta Key. Two beach chairs and a beach umbrella are in the condo for your use. The heated pool area is next to a small picnic area with charcoal grills and Tiki hut. Relax by the pool as you watch the boats go up and down the Intracoastal waterway or head down to the dock for some amazing fishing. There are a huge variety of fish you can catch. You can either get your bait fishing from the dock, or head down the road to Mr CB's to buy some bait. Walk across the street and go through the private access gate to a beautiful stretch of Siesta Key's Crescent beach. If you are interested in stand up paddle boarding, parasailing, jet-skiing, scootering - there are rental facilities nearby along with lessons for beginners. Coin-op washers and dryers are located on the first floor in the laundry room just a few doors down. 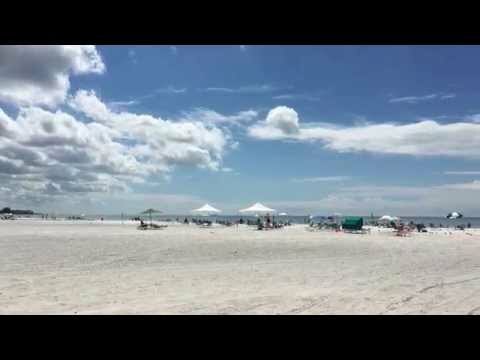 No other beach in the world is as clean, white sand, cool on the hottest days and as safe to swim as Crescent Beach/Siesta Key beach!! This particular unit has been completely refurbished and is better equipped than many condos costing twice as much to rent. Chip is a software Architecture Manager and Miao is a Realtor with Berkshire Hathaway . We have lived in Sarasota since 1990; we have traveled to Europe, Asia, the Caribbean and much of the United States and consider Sarasota to be one of the best places in the world. We have put a lot of love and effort into this unit and vacation there ourselves, our hope is that you enjoy it as much as we do. Miao and Chip purchased this condo in 2015. When we were looking for condos on Siesta Key, this one had it all! There is nothing like sitting by the heated pool, watching the boat traffic going up and down the bay. The fishing from the dock is fantastic - you can catch a wide variety of what the bay has to offer - Redfish, Snook, Snapper, Flounder, Ladyfish, etc. It has a boat basin for our boat when we stay there and the beach is just across the street. In the village, there are an abundance of good restaurants and shopping. In Sarasota, you can visit the Ringling Museums, Ca' d'Zan, Selby Gardens, take in shows at the Van Wezel, Sarasota Opera House, or one of the local theaters.